Holt Glass Works never existed! We've been hoodwinked. Yep, I'm guilty as charged, along with a lot of other collectors. I swallowed the Holt myth hook line and sinker for the past God knows how many years. 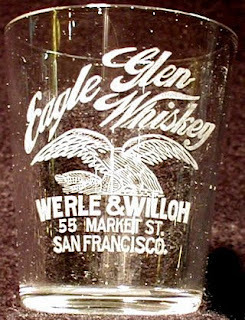 According to legend, Holt Glass works was located in West Berkley California, and was dated to ca. 1893 - 1906. This according to Dr. Julian Toulouse in his work "Bottle Makers and Their Marks" written in 1971. Unbeknownst to each other, Andrew K. and I have been working independently on documenting the dates that Holt Glass Works was supposedly in business in order to more accurately date some of the transition whiskies from the turn of the century (TOC). Somewhere, I thought that I recalled hearing or reading that the factory had been rebuilt in 1905 after some sort of calamity and subsequently went to the ground for good on April 18,1906, courtesy of the Great Earthquake and Fire. We tried to use those events as a research tool as well. Problem was, the harder we researched, and the deeper we dug, the more it's mere existence seemed to slip from our grasp. To heck with tightening up the time frame and narrowing down the "* H" to "*** H" base mark. We couldn't even find written documentation of a Holt factory. Andrew published the following this morning on the glop top site. His research seemed to point increasingly to the probability that existence of Holt Glass Works has been nothing but a myth. "Did Holt Glass Works Even Exist?? We were able to find one link to a Wm. Holt in conjunction with glass making in Berkeley. The reference was gleaned from a book written in 1952 entitled The Glass Industry; Volume 33‎ - Page 256 (Technology & Engineering - 1952). The dating is close, but no cigar when it comes to a match according to what Toulouse wrote. And where did they get their information back in 1952? Why can't we pick up the trail of breadcrumbs? Is this what Toulouse used when he listed Holt? And why the discrepancy in dating the enterprise? In the meantime, weeks worth of corresponding finally started to pay off and I began to receive information from research librarians and historical societies in the East Bay. I also spent the better part of this afternoon digitally screening all copies of the S.F. Call, and other Bay Area newspapers for news articles and or advertisements. I ran Holt Glass, Berkley glass factories, Berkley glass works, etc. etc. from 1895 - 1905. The search was absolutely void, nada, nuthin'~. I say, too many inconsistencies and contradictions! Holt Glass Works - Myth Busted? A. P. Hotaling's OPS brand first appeared on the market around 1878. Two very similar examples exist. One is #52 in the latest Thomas text and was blown in a full face two piece mold with an applied top. It is embossed OPS / Bourbon / Whiskey / From / A. P. Hotaling's / Old / Private Stock . San Francisco. Another nearly identical mold variant exists, but is missing the "OLD". It's listed as #53. It's actually the older of the two. A very small number of #52 have been seen with tooled tops and are extremely rare. They fall into that crossover category that we recently discussed. Ebay currently has an opportunity for someone looking for one of the tooled variants. The seller has described it as "OPS in fancy monogram / BOURBON / WHISKEY / FROM / A.P. HOTALINGS / OLD / PRIVATE STOCK / SAN FRANCISCO / .. A Pristine example with ZERO ISSUES .. Tool top, 2 piece mold with the front being nicely whittled, a few scattered bubbles. Only the OPS bottle is being offered. Superb example of a 1885-1892 Western whiskey. Listed in Barnett # 218 t." The photos appear to depict an exceptional example with strong overall character and a great strike. According to his count meter, quite a few folks are watching it and I wouldn't be surprised to see the snipers hard at work tomorrow afternoon when it closes! Photos courtesy of Ebay and the consignor, "dabitterinn"
Makes you want to say "bless you" after someone says it. Sounds more like a sneeze than a brand of whiskey, doesn't it. Actually, Old Potuin is the proper name and it was a Johnny Come Lately to the west coast liquor game. Josiah Harbinson was a relative later comer to the Sacramento whiskey crowd, tossing his hat in the ring in 1903. Sacramento was already a thriving metropolis in 1903, thanks in part to the fact that the city was the west coast anchor for the transcontinental railroad and also the state capitol. 1903 saw the establishment in Sacramento of both the first automobile dealership and J. Harbisons liquor wholesaling endeavors. He chose 1917 6th St. as the home for his fledgling enterprise and selected B. W. Houchin, Old Buck, and Old Potuin as his flagship brands. 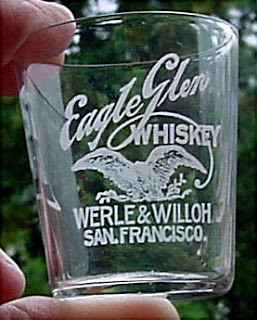 Etched pre-pro shot glasses were ordered for the first two brands. 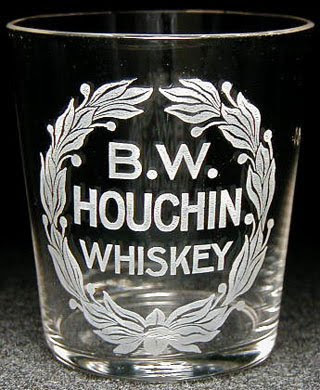 The B. W. Houchin glass has an attractive pattern, with bold lettering surrounded by an intricate wreath pattern. A highball glass also exists. 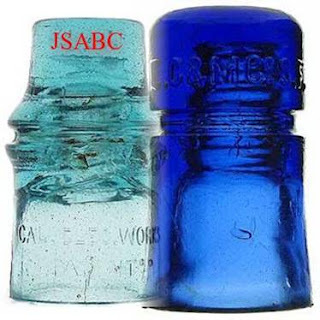 Both this brand, and Old Buck that follows, were registered to Harbinson in 1906. 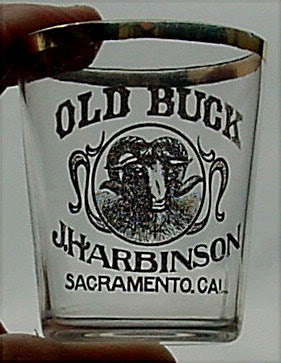 The Old Buck glass takes shot glass art to a new level with an ornate and detailed picture of, none other than Old Buck. Old Potuin - (bless you); no shot glass known, but... a killer embossed whiskey does exist. Blown with a tool top in clear glass that will turn amethyst, the Old Potuin is extremely scarce. The brand was registered to Harbinson in 1905 and was his earliest. I've seen two, and only heard of a few more kicking around since I started collecting back in the sixties. 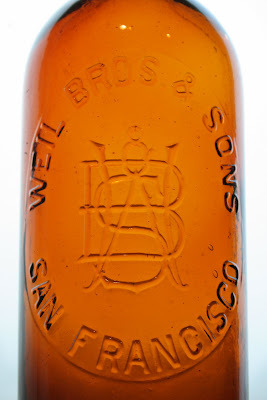 The bottles have a slight domed kick up with an unusual base mark; 400 over the number 1. They are air vented at the shoulder and the embossing is set into a round slug plate. Around 1906 Harbinson packed up and moved to new digs over on 2nd St.; 915 2nd to be exact. In 1916 he partnered with his brother and the firm name was changed to Harbinson Brothers. No known shot glasses or bottles exist for this partnership, although odds are, a lot of slick cylinders and flasks found in the neighborhood at one time sported paper labels with their name on it. The brothers remained partners at the 2nd St. address until shutting the doors around 1918, courtesy no doubt due to the looming passage of the Volstead Act and subsequent prohibition. Footnote: Thanks to Robin P. and his photo rchives for use of the shot glass photos. Second Footnote: The Old Potuin example pictured in this article has been consigned by a fellow collector and is available for purchase. Feel free to email me for details and pricing. The photos of the #16 base Eagle Glen drummed up quite a number of emails. Obviously, this particular brand of tool top picture whiskey has a pretty loyal following. The firm of Mohns and Kaltenbach first registered the brand in 1895. It was then that the now infamous amber #16 base with high domed kick up bottle was blown. By whom, we still don't know (hint - hint). The embossing detail and relief is beyond compare. 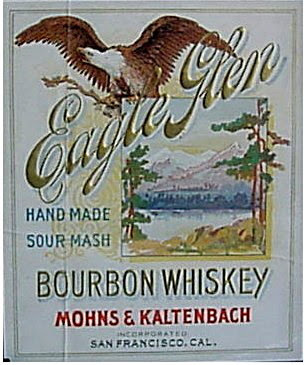 There is literally nothing left tothe imagination and the eagle looks as though he could fly off the face of the bottle. 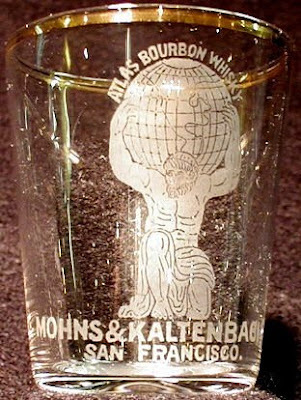 A clear picture variant was also produced in a different mold with the typically seen flat base. A flat flask was also produced for them. Also called a "dandy flask", many of these had threads blown through the top, were then finished off on the grinding wheel, and topped with a fancy pewter cap. matching etched pre-pro shot glass. According to records, the firm became Mohns and Mohns in 1901 (S.F. Call- June 15, 1901 advertisement), when Kaltenbach left the partnership. The clear mold from Mohns and Kaltenbach was reworked for the firm. Some examples show strong detail in the wing feathers whereas other are notably weak; similar to the Phoenix Whiskey. And true to form, another flat flask appeared. The firm of Mohns and Mohns incorporated either in late 1903 or early 1904. A new mold was cut reflecting the incorporation. 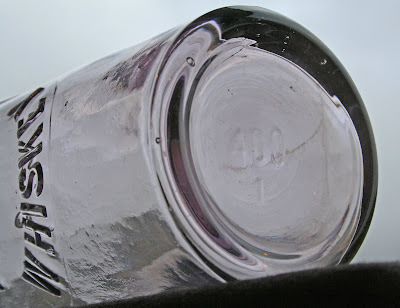 The bottles were blown in clear glass only and once again, the detail is striking. Notice the reappearance of the nearly vertical "AND"? This partner ship lasted until 1904, when Werle and Willoh purchased the brand. 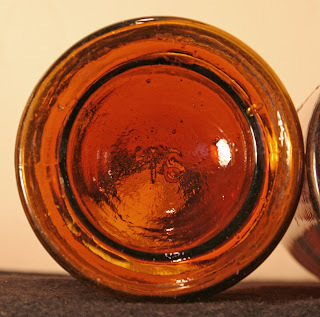 The old mold was reworked yet again for Werle and Willoh with bottles once again being blown in both clear and amber. By now, the mold is showing consireable wear and the loss of definition becomes obvious. A time line of documented addresses is as follows; 29 Market (1905-1906), They were burned out in the '06 earthquake and relocated to 55 Market (1907-1916), 147-149 Market (1917). Research over the past few days has confirmed that the 59 Market Street addess is indeed a mold cutting error that was caught shortly after a small run of bottles was produced and distributed. They are rarely encountered. 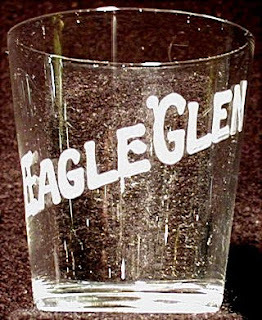 The firm also commissioned the production of three different etched shot glasses. 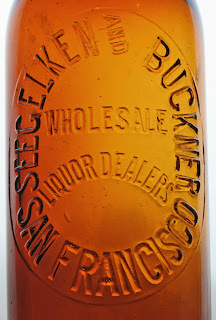 In addition to the cylinders and shot glasses, a "dandy flask" was also produced for them in both amber and clear glass. Notice the address goof on this bottle as well as the cylinder? This example still sports the original label! A special thank you to Rich L. for his assistance with this article and the photography of many of these examples! As many of you know, Bob Barnett assigned all rights to the Western Whiskey Bottles series to me shortly before he passed away. 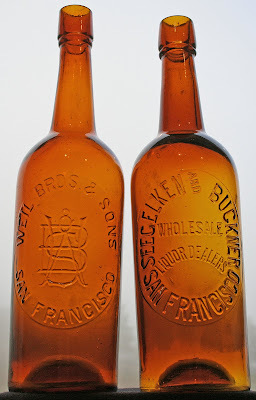 Bob's final work was Western Whiskey Bottles 4th Edition. Maybe a blessing in disguise. Rumors of a large number of new finds have circulated since the "crash", giving us a chance to add a lot more listings to the new edition. The work on the 5th edition has resumed (actually re-started from scratch) and I am actively seeking documentation of "new" western whiskies, regardless of whether they are glop or tool tops. If you have an unlisted bottle that is not present in the 4th edition, please forward crisp, detailed, photos of it to me. I'd like both a full body shot, as well as a close-up of the embossing. Also, feel free to forward any specifics about the provenance. Damage is not a consideration; whole bottles or just embossed panels are welcomed.